Customers at Stretton Co-op in James Brindley Way raised £500 towards the cost of the canvas tent which has been erected in the grounds of Fountains Primary ready for the new school year. The tepee will be used for a variety of activities including story time and there will be logs inside for the youngsters to sit down on. 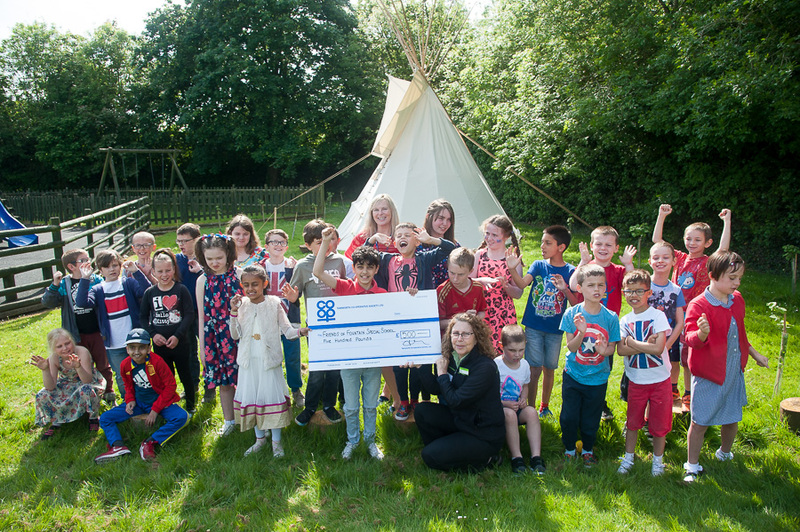 Marina Hutton, manager of Stretton Co-op, hands over the Community Dividend Fund cheque to delighted pupils at Fountains Primary and head of school Nicola Price, with the new tepee in the background. Marina Hutton, manager of the store, presented a cheque for the money raised from the store’s Community Dividend Fund scheme. The waterproof shelter has been put up in a Forest School area which is being developed to give the pupils more time outdoors each day, both for learning and play. As well as the tepee – which was traditionally used by North American Indians – there will be a barefoot walk and a pond to stimulate their senses. The Friends of Fountains PTA has also helped raise funds for the project with trees being planted to enhance the environment. The school caters for 130 children aged three to 11 with a range of learning difficulties including autism.